CNC M-code M00 is used to stop the cnc program in the middle when it is executed by a cnc machine. 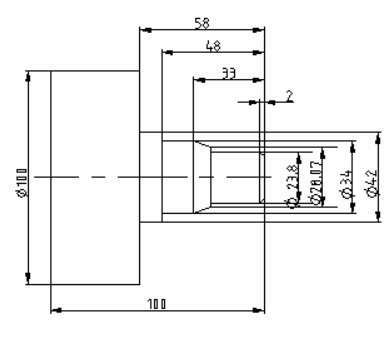 When M00 appears in a block, the machine will stop cnc program execution, that means both tool feed and spindle speed are stopped. M00 stops following cnc functions. M00 doesn’t reset the cnc machine program. The cnc machine retains it’s active state such as Tool Offset, Feedrate, Spindle Speed, Coordinate Data. If you press the cycle start buttonagain, the machine will continue to run by the program blocks after M00 block. If you want your machine stop every time when the program be executed to some blocks, you just use M00. Component Inspection while the component is still in machine. Tool Condition can be checked. Chip-removal, see the below cnc program example. As you may see in the above cnc programming example the cnc program will stop every time at block 145.